I know, I know! We absolutely love our Silhouette machines, but that darn print and cut can be enough to want to throw our machines right out the window! Can I get an amen? Well, today, my friend, I’ve got some great news for you! 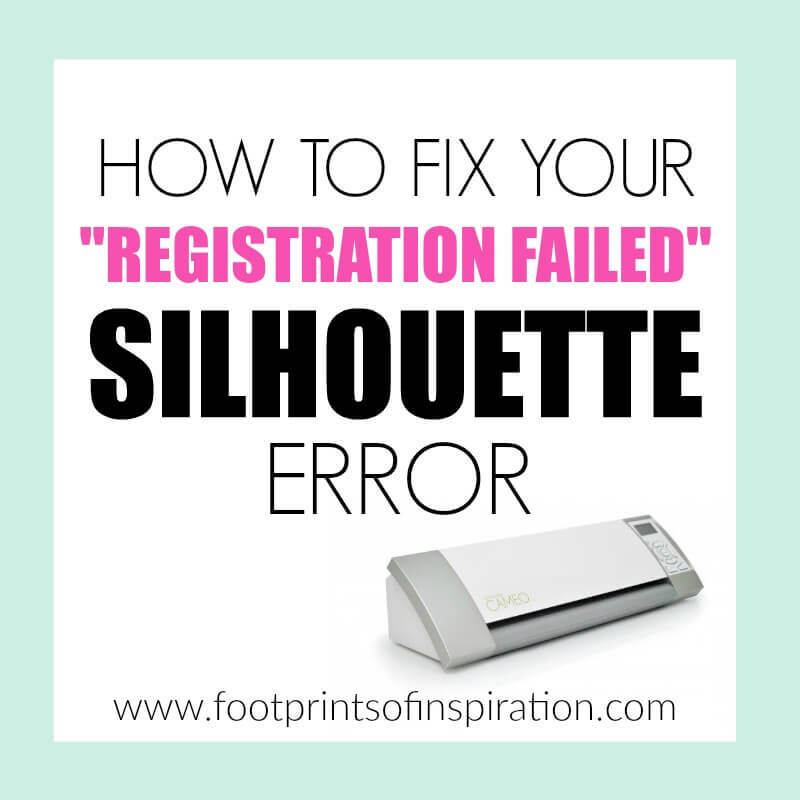 I found the absolute best fix for your Silhouette “registration failed” error. I realize that’s a tall order, but this fix works every single time! For your convenience, this post contains affiliate links. See our privacy and disclaimer page for more information. I recently launched my new free monthly sticker cut files (If you haven’t signed up yet, click the following links to have them delivered right to your inbox every month! 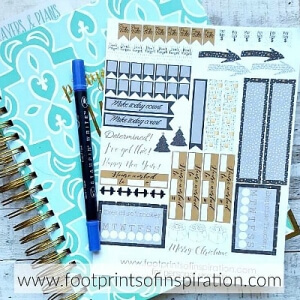 Day planner stickers and Prayer Journal stickers. 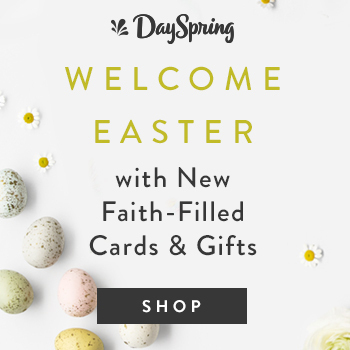 I’ve been bouncing in my seat with excitement about these fun freebies!) and was preparing to get them cut. So I loaded my favorite sticker paper in my printer, printed them off, adhered them to my mat, adjusted all of my settings and hit cut….. I thought, no problem! 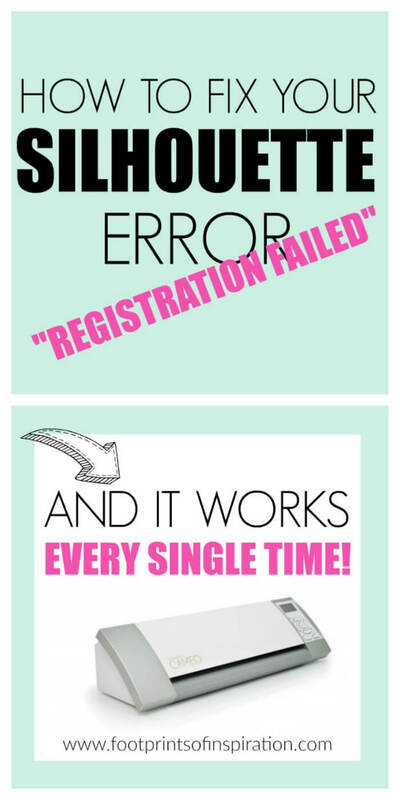 I’ll just unload the mat, reposition the sticker paper, and hit cut again….registration failed! Seriously?! I then did what everyone does next. I took to Pinterest and the help section in Silhouette America to find out how to correct it. 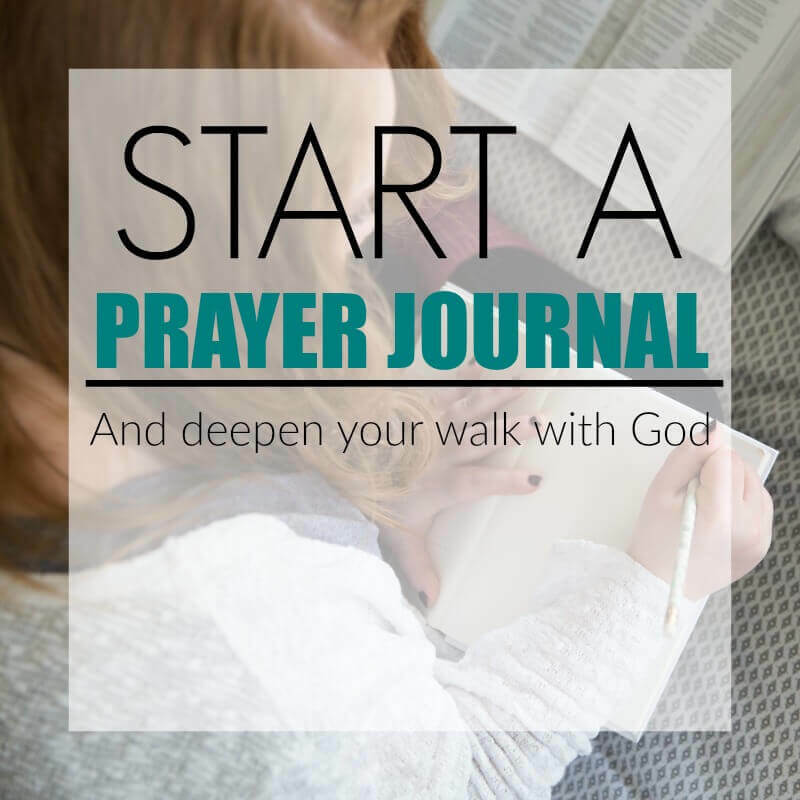 As I’ve done countless times in the past, I tried all the common “fixes.” You know……. I moved my machine to the brightest spot in the house. I shined a flashlight on the area. Made sure I didn’t change the 4th setting (bottom inset) in my registration marks window. And then I came across a Silhouette game changer! And it works! Every. Single. Time! Let me start by explaining why this is happening. 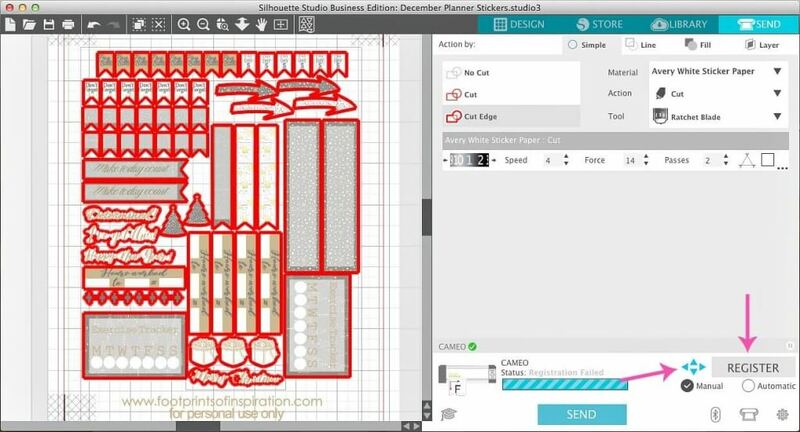 When you apply registration marks in Silhouette Studio before printing, it aligns your Silhouette and tells it exactly where to cut. You want less waste and more room for your designs, so you move the left, top and right inset to make this happen, but it “confuses” your machine and you get that oh-so-frustrating Silhouette “registration failed” error. Important! Do not change the Bottom Inset! (See the picture below.) That must be left where it is! Since you made these adjustments, you now have to show your machine where the new registration marks are. And this, my friend, is downright simple! The registration mark that we’ll be focusing on is the little black box on the upper left corner of your paper. In the “send” window (I’m using V4.1. If you’re using an earlier version, the steps are still the same.) go down to the bottom right and, using the turquoise arrows, manually move your housing unit on your Silhouette so that the cutting blade is situated directly over the upper left box on your paper. 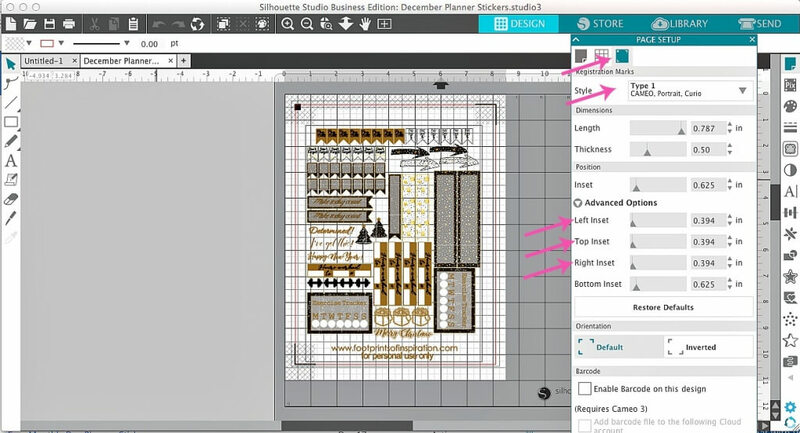 **Update** If you’re using the latest version of Silhouette Studio, there are now two boxes to the left of the blue arrows. Click “Manual,” prior to moving the housing over the black box. Click the “register” button (to the left of the turquoise arrows on your computer screen) and, drumroll please….., music to your ears! That wonderful sound of your machine registering those marks!! That’s it! It’s truly that easy! Now you can fall in love with your Silhouette all over again! If you’d like to see this great hack in action, check out this game-changing video from Palettes and Playdough. Want more help with your print and cut files? Check out How to Print and Cut on Your Silhouette. 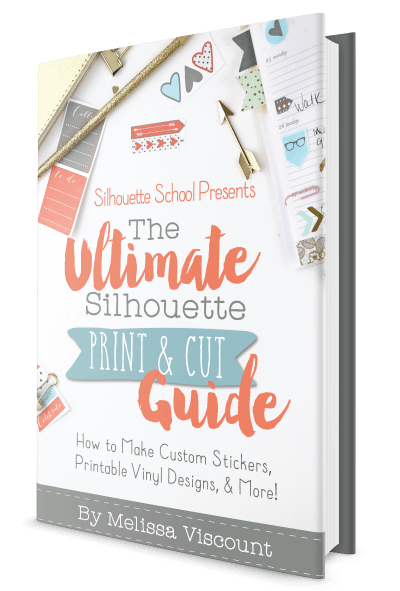 I also, highly recommend Melissa Viscount’s book, The Ultimate Silhouette Print and Cut Guide. I have it right on my computer and keep it minimized so I can refer back to every time I’m in Silhouette Studio. In fact, she has a whole array of books to help you master your Silhouette! Do you have a favorite Silhouette hack? Comment below and share! We’re always looking for a great tip! Don’t miss a single post! Sign-up for my newsletter below and have them delivered right to your inbox. Until next time, my friend……. P.S. Every month I’m sharing a free SVG Sticker Cut File. Don’t miss out! Click the following links to have them delivered right to your inbox! What I find frustrating is that they shouldn’t allow you to change the inset if their ridiculous machine can’t actually operate that way. My machine currently can’t register anything. Even if I put my item directly in the middle of the page and set the registration marks to default. I’m so frustrated with this machine. There’s no rhyme or reason for the errors it makes. I really hate it and if my files weren’t already in this format I’d switch to some other machine. Hi Liz. It really can be frustrating. I’m sorry you’re having trouble with it. I think it’s time to contact Silhouette and see if they have a fix for you. Outstanding! That’s certainly something that Silhouette needs to work on but I’m so grateful for that fix! Thanks so much for reaching out and taking time to respond. I just read your tip and this helped so much. My only issue now is that I have to manually do it by hand every time. 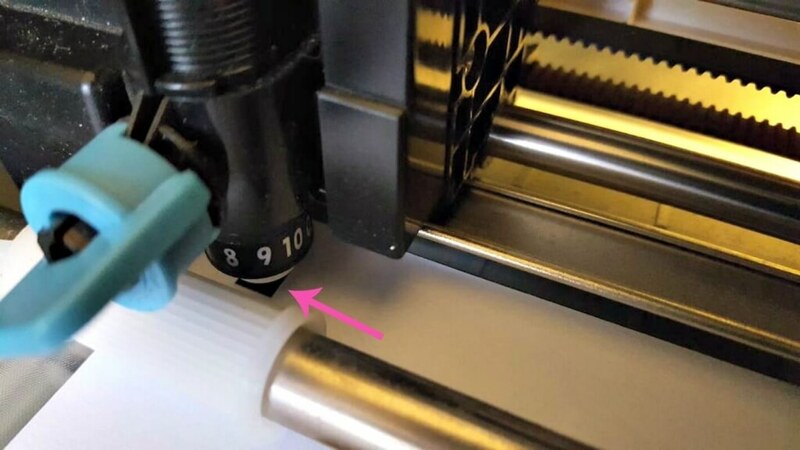 Is there a way to get the machine to remember the setting you have it on? I Ciari! Thanks so much for stopping by the blog and taking time to reach out. I’m so glad this worked for you. It’s a complete game changer. To my knowledge, no there’s isn’t a way to set it. I also have to manually register mine almost every time. I’m hoping this is a bug that Silhouette will eventually fix, but for now, we have to manually set it up. Hi Kelly! Thanks for taking the time to reach out. I really appreciate it! I am so glad this worked for you. It really is a frustrating thing with Silhouette, but that fix works like a charm! Happy crafting, my friend! This does not work for me. I’m better off just using scissors. I really regret buying this junk machine. Oh Jeanniene, I’m so sorry you are having so much trouble. It can be frustrating, but once you figure it out, it can be one of your favorites. I’m really not sure why it’s not working for you. I would contact Silhouette through their Facebook page or by calling them directly and see if they can walk you through it. Once you get it going, I have no doubt you’ll enjoy using it. I’m not sure if I’m having a registration issue, but I have a print and cut file that works perfectly for two, and then the third copy the bottom left registration mark is completely ignored and the cuts are way off. It’s so frustrating!! Why does it work perfectly for two copies and not the rest? Turning the computer, and Silhouette off does not seem to make a difference. Hi Sue! Thanks for stopping by the blog. Hmmm, I honestly don’t know why your third cut is not working correctly. That is extremely frustrating. Perhaps you could get on the Silhouette Facebook page and see if anyone there knows what’s going on. I’m sorry I have no help for you, but I truly can’t figure out why that would be happening. Thanks Tammy – I have Silhouette support looking into it for me. I feel like it might be an error with the data that’s being held with the machine. Oh good, Sue! I hope they can get it figured out for you! I’m so glad it worked for you. It’s such a quick, easy fix, and was so frustrating before I figured it out! Thanks so much for taking time to stop by the blog. This saved my sanity. Thank you! You are most welcome, Kel! It truly is a game changer! unfortunately I attempted this “fix” and my machine will still not recognize my register marks. I’ve placed the scanner directly above and as soon as I click register….. it moves to a different area and states it could not register the marks. Hi Amanda. I’m so sorry you’re having so much trouble with this. It is so incredibly frustrating. I’m not sure why your machine is doing that. Have you tried moving it to a well-lit area or shining a flashlight on it? Hi Kari! I’m sorry you are having so much trouble with the registration marks. They can be so frustrating, but when they’re working, it’s so much fun. I’m not quite sure I understand your question. When you go into the “registration marks” tab, be sure that you’ve selected which machine you are using. Then you should be able to click “advanced” which will open up the ability to move the inset buttons over to the left. (Just remember to never move the “bottom inset.”) Also, you may want to make sure that you have the latest version. Let me know if that takes care of the problem. Thanks so much! 9 days to the wedding and you saved me!! I was so desperate I was going to buy a new one at any price. Which would not have worked anyhow!! Thank you soooo much!! Oh my goodness, Bretta! I’m so glad it worked for you! Congratulations, on your wedding. Enjoy the day and remember to sit back and enjoy! Thanks for taking the time to reach out! Hi there. I am using a PixScan mat and am having registration errors. I tried to manually adjust the registration, but I can’t get the blue arrows to manually move it far enough to the left to find the black square on the PixScan mat. Any suggestions? Thank you for all of your tutorials and info! Hi Kelly! Thanks for stopping by the blog. Believe it or not, I don’t have a PixScan mat yet. Crazy, right?! So I’m not sure how to get that to happen. Perhaps try, http://www.silhouetteschoolblog.com and see if you can find some help from Melissa. She has some incredible tutorials for us! I’m sorry I can’t be of more help to you. Kelly did you ever get the issue with the Pixscan mat figured out? I am having that same issue! Outstanding! I’m so glad this worked for you, Sandra! Hi Janet! Thank you so much for taking the time to reach out! I’m so glad this fix helped you! It’s an incredibly easy fix, but I, too, was ready to throw my machine out the window when I stumbled upon it and knew I needed to share it with all of you! Now, this trick works every single time! Again, thanks so much for reaching out and stopping by the blog! Happy crafting! Thank you so much..I have been trying all morning to get my stickers cut. Outstanding! It can be such a frustration, but once you know this little trick, you can cut away… lickety split! Thanks so much for stopping by the blog and taking time to reach out, Cathy! I really appreciate it. Outstanding! It’s an amazing little trick! Thanks for reaching out and letting me know! Outstanding, Harmony! This is such a frustration with the Silhouette, but now that I know this little trick, it works every single time for me! Thanks for taking the time to reach out and let me know! Well, drat, Bryan! Did you check out the video to walk you through it? I wish I could tell you exactly why it’s not working, but if that’s not it, I’m out of ideas for sure. I can not move my housing unit manually! I click on the blue arrow buttons and nothing happens. Please help! I am so frustrated! Tiffany, I’m so sorry you’re having trouble. So the arrows in your software aren’t moving it? Hmmm, I honestly don’t know why they aren’t. Did you try restarting the software and reconnecting to your Silhouette? (Insert eye roll here! Of course, you did, but you know that’s the first thing every computer person asks!) Are you using a cable or Bluetooth? And you checked your insets to make sure you didn’t move the bottom left, correct? If you’ve done all those things, I’m truly at a loss. I’m so sorry! Hi Tammy, Thank you for posting this. Unfortunately it hasn’t helped with my registration issue. One thing I did find helpful in your post was mention of not adjusting the lower left inset. 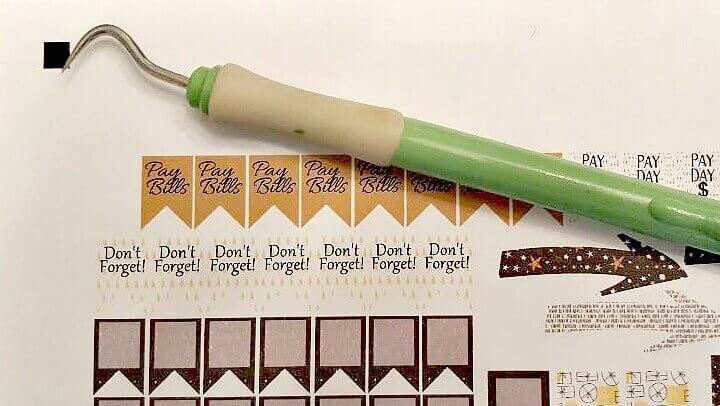 I find PnC feature, along with making sure items are correctly positioned on the mat, of the Cameo cutters to be highly frustrating and wonder what, if anything, Silhouette plans to do about addressing this. It seems folks are spending countless hours and wasted material searching for a sufficient workaround. I mainly use PnC to contour cut my T-shirt transfers and it’s extremely frustrating constantly having to re-position costly material. Recently I’ve been having issues with it reading reg marks for the sticker paper (clear and white). I figured since the clear sticker sheets have the adhesive backing I’d be able to setup with “no mat”, print reg marks and cut quickly. But, to no avail (heavy sigh). load quickly such as Roland or other plotters. Hi Tina! Thank you for stopping by the blog and taking the time to reach out. I’m sorry this trick did not help you. I couldn’t agree more, it is definitely a big headache for Silhouette users and Silhouette needs to address it for sure! I hope by keeping that inset where it is, it’ll help make it easier for you. Thanks, again, for reaching out! I found your page while frustratingly googling a fix for the registration error. I just want to say thank you! As a new Silhouette user, I really appreciated the detailed description and visuals. Hi Kelly! Thanks so much for stopping by the blog and taking the time to reach out! I’m so glad this fix helped you. It was such a frustrating thing with the Silhouette and made me crazy at times. Now that I know how to correct it, it’s made my life so much easier! Thanks, again! Hello! I have been using Sillhouette for years. This is my 5th machine, and I’m so frustrated with it. Cameo 3. I’m going to try your suggestion, but I’m curious. Since I print on a 24 inch plotter, my sheets are 12×24 which changes the orientation. Which inset should I leave alone? Would that make it the right one? Also, it fails on the first mark (square). Would the positions of the other marks effect this one? It fails before even trying the others and can’t ever seem to find the first one. Even when I manually try to do it, it fails most of the time. This drives me nuts cause you can’t use the arrow window on the machine once it has failed so I have to use my computer to do it. I’d love some help. Thank you for your time! Either way I’m happy to have found your blog! Cute stuff!! Hi, Juliann! Thank you for stopping by the blog and taking the time to reach out. Truthfully, I’ve never printed on a sheet that large before, so I don’t know for sure how that would work. However, my guess would still be that you can move all the insets, except for the lower left (just like a regular 8.5 x 11″ piece of paper.) Mine fails often on the first mark (square) and that’s when you have to manually move it. I, too, move it by using the arrows on my computer (in the “send to Silhouette” screen). You want to move the housing directly over that square using the arrows on your computer screen and then click “register.” That should correct the problem for you. I hope this is making sense. Let me know how it goes for you!